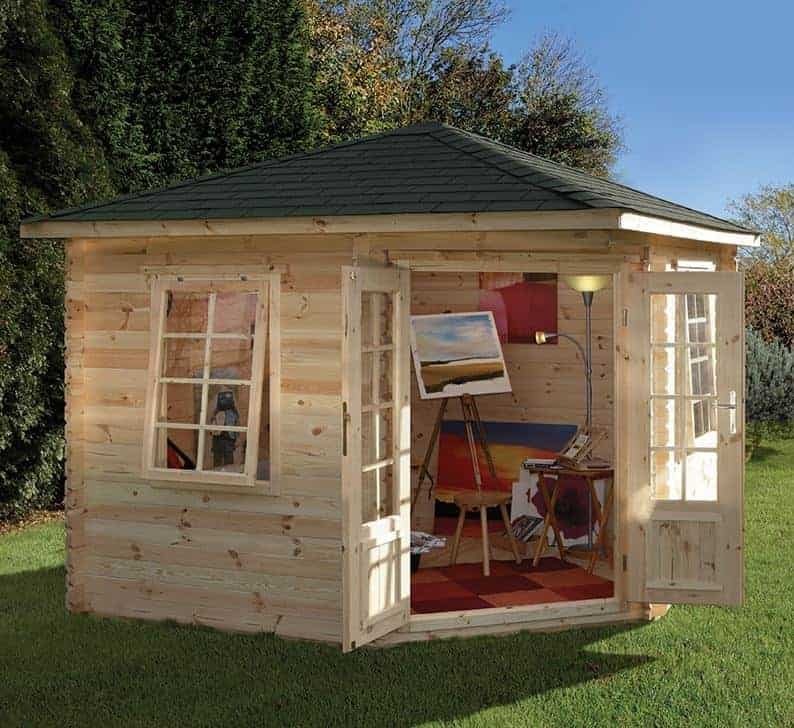 There is no better compliment to a beautiful garden, in our opinion, than a beautiful log cabin, and we don’t review many garden buildings that are as striking as this woodcote log cabin. It has a very large interior capacity as well, and yet thanks to its clever square design it won’t take up too much room on your property. 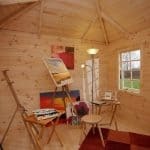 It means that you can have one of the larger log cabins on the market, even if you have a relatively restricted garden. 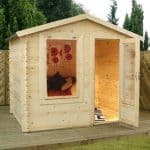 Made from interlocking log cladding, in a tongue and groove style, it’s very rain resistant so you can be sure that the contents will remain dry. This is also helped by the apex roof that causes water to run harmlessly away as well as creating a structure that’s tall and accommodating. 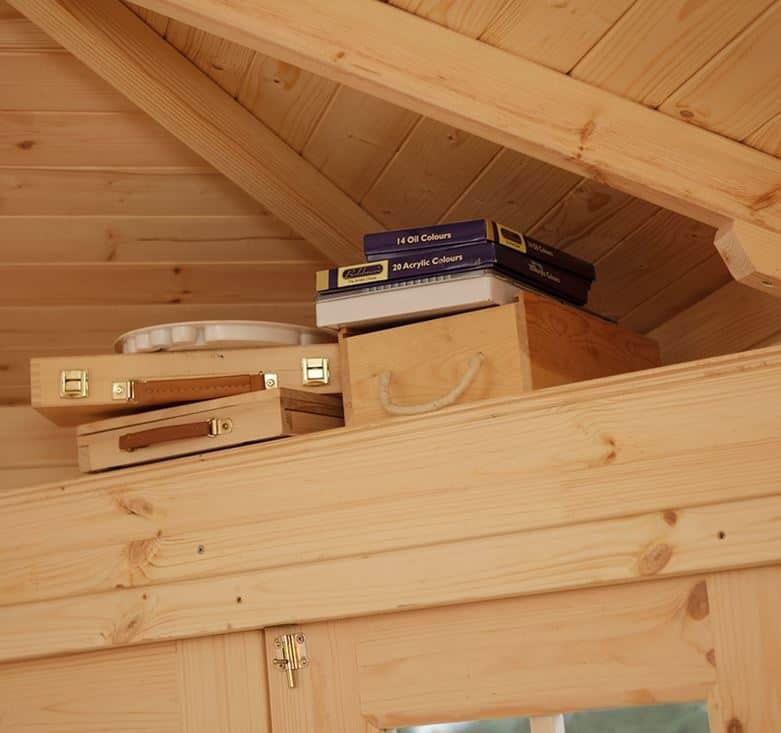 You will need to treat it yourself with a high quality wood preserver, however, to keep its weatherproof qualities. The double doors are set on a diagonal and are themselves half glazed, so with full sized windows on either side, there’s a lot of natural light inside the cabin. We were pleased to see that the windows open as well, as this allows for easy ventilation and temperature control on warmer days. From the moment we saw this apex roofed log cabin we were struck by its aesthetic appeal, thanks to its harmonious blend of glazing and light coloured timber, as well as by its clever design. Because it’s square shaped with a flat back wall, it can fit perfectly into any unused corner. 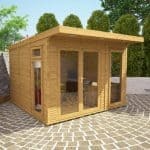 This means that even though it’s a very well sized log cabin it will suit gardens of almost any size, and won’t stand out obtrusively. We were pleased to find that the apex roof at the summit is made of felt covered tongue and groove, and at 19mm thick it’s very tough and weather resistant. It’s also very tall and gives a ridge height of 2.60m and an eaves height of 2.13m. The external width and external depth are both exactly 3.00m. There were many things that we liked about the interlocking log cladding, foremost among these being the 28mm thickness which, in conjunction with the heavy duty frame, gives excellent strength and stability. There are chalet connectors on the corner as well, which is excellent at keeping wind out. We were also pleased at the modular design which means that despite it’s size it’s relatively quick and easy to construct. The floor is made of tongue and groove, which is another welcome sign of the attention to quality paid by the manufacturers. 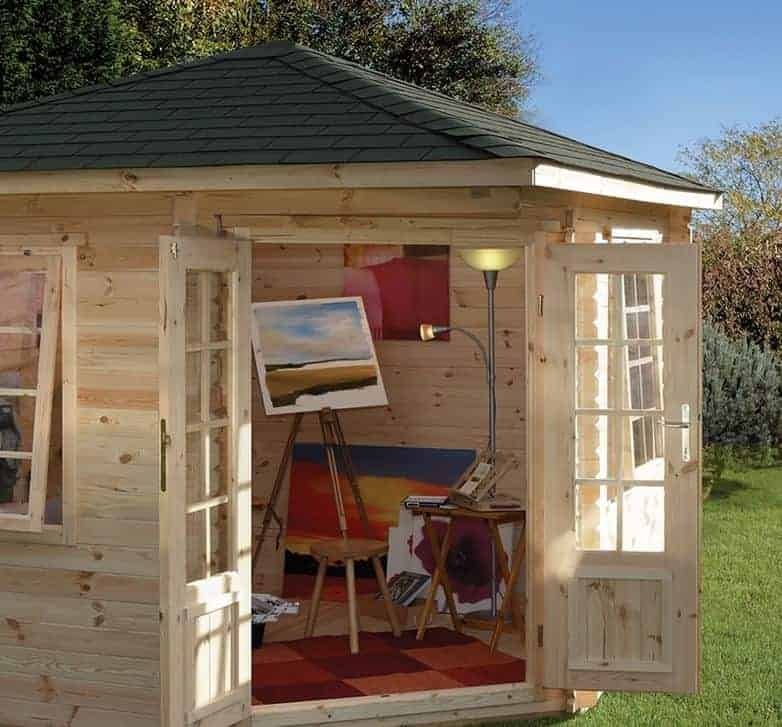 Sharing the same 19mm thickness as the roof this is one of the sturdiest floors we’ve seen in the sheds and log cabins we review, so you won’t have to worry about the effect of heavy furniture on it. This log cabin performs so well in other areas that we were a little surprised to see it fall down here. The pale timber is very attractive, but it’s also a sign that no preservative treatment has been applied prior to shipping. This needs rectifying immediately, or wet rot can quickly set in. This means that the customer themselves has to apply a high quality wood preserver before or after installation, and they’ll need to keep this up on an annual basis as well. 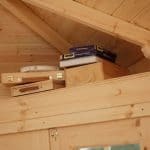 Another effect of the lack of preservative treatment, is that the log cabin comes with just a one year warranty, which is the statutory minimum period. For such a large investment, we expected to see a much longer guarantee. We liked the look of the double doors, featuring glazing across their upper two thirds and set on an eye catching diagonal. They’re very accommodating size wise as well, with a width of 1.21m and a height of 1.79m, so you won’t have to stoop down when going in and out. This also means that it’s easy to install tall or wide items, such as chairs or even televisions, inside the building. We were pleased to see that the glass on the door was double glazing, as were the opening windows on either side of it. Not only are they tough, they are also very good at keeping sound out, and heat in. Whilst the tough glazing can itself act as a deterrent to intruders, the greatest deterrent of them all is a secure locking system. That’s why we were glad to see that a key operated lock is included here as standard. It not only creates a very secure and reliable locking system, just the sight of it can make opportune thieves pass by and look for an easier target. We liked both the look of the roof, and its effectiveness, but for those who want a shingle style roof that can be achieved as well thanks to an optional extra at the time of purchase. The upgrade to felt shingles does cost the substantial amount of £275.99, but once in place the effect will be very striking. 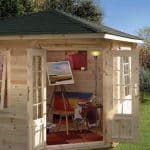 Another extra that adds considerably to the initial price of the log cabin is a professional installation service. It costs £599, yet it can save time for those with busy lives and it should ensure a perfect assembly. 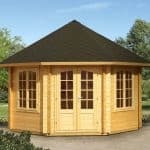 This beautiful log cabin both looks and feels high quality, and the use of chalet connectors is just one of the indicators we saw of that. 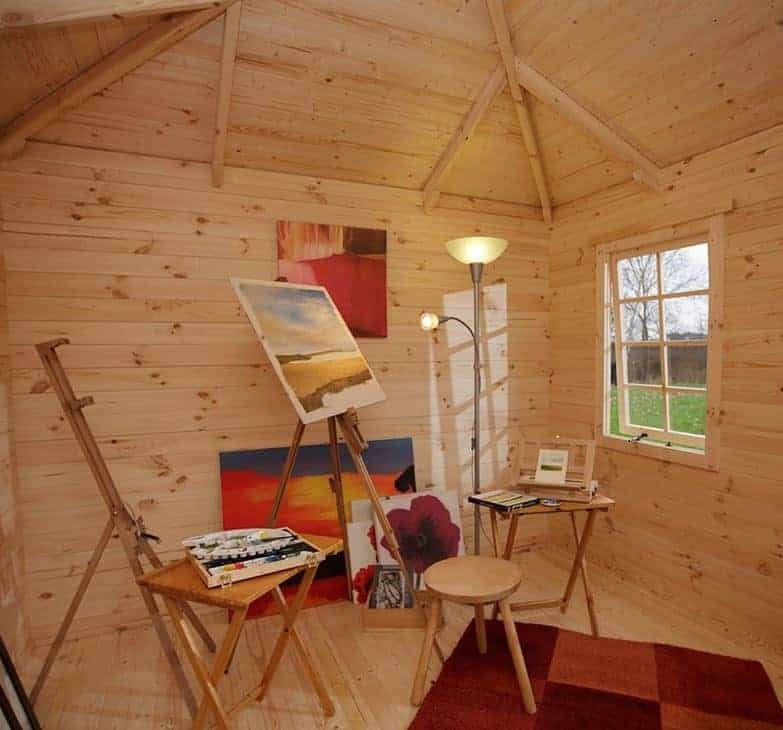 With an immediate application of wood preserver, and yearly treatments, this can be a durable building, but at this price we feel it’s a pity that a long lasting pressure treatment wasn’t used by the manufacturer. 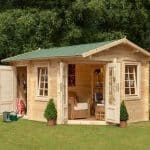 We have reviewed larger log cabins, but given that it can fit into most sizes of garden this still provides a lot of space inside. The modular design makes this much easier to install than you might expect, and with a friend’s help the full assembly can be completed in around five to six hours. 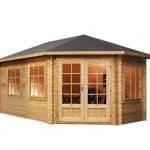 For such a well designed and high quality log cabin, this represents reasonable value for money even at this price, although the lack of an extended warranty is a concern. Final Thoughts: The use of kiln dried nordic spruce not only makes this a very tough and solid building, it also makes it one of the most attractive log cabins we’ve seen. It’s important however that the timber isn’t left in this natural pale state, but treated with a wood preserver that will by its nature darken the wood. Other than this annual requirement, this cabin has everything that we like to see. It was good to see, for example, that it has a key operated lock and that it has two opening windows that are double glazed. It means that you’ll be able to keep the interior warm, and keep potential intruders out.